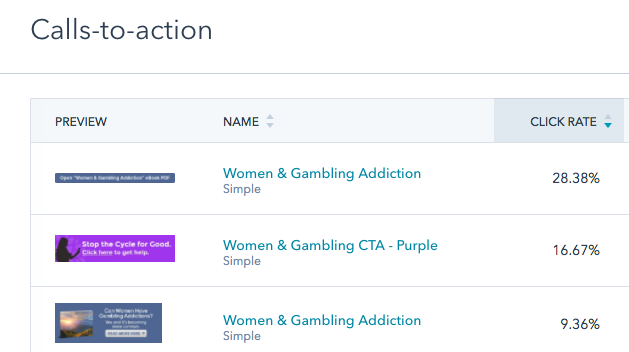 This blog post digs deep into the successes we've had with our client, Algamus Gambling Treatment Center, during Growth-Driven Design and Inbound Marketing campaign. What's uniquely interesting about Algamus is that they were directly affected by Google's stance on addiction treatment center advertising, which caused some of their competitors and partners to shut down. The fact that Algamus was able to weather the storm is directly attributable to their inbound marketing campaigns. Algamus Gambling Treatment Services is a gambling specific addiction treatment center in Arizona and is one of the only gambling specific treatment centers in the country. Prior to working with Meticulosity they had engaged the services of another SEO company. After the company failed to deliver on their promises, Algamus was referred to us by another one of our clients. They wanted to improve their keyword rankings and website traffic; we developed the strategy and executed it to help them achieve these goals. Their existing website was not optimized for nurturing traffic to convert them into leads, nor did it have content specific to their unique buyer personas. Identifying the buyer personas for this client and not relying on stereotypes was going to be essential for content development. Some specific challenges for Algamus were lead attribution. Knowing which leads and admissions were generated from referrals, from ad campaigns or from other sources was a gap, which made optimizing the website and the campaigns very difficult. 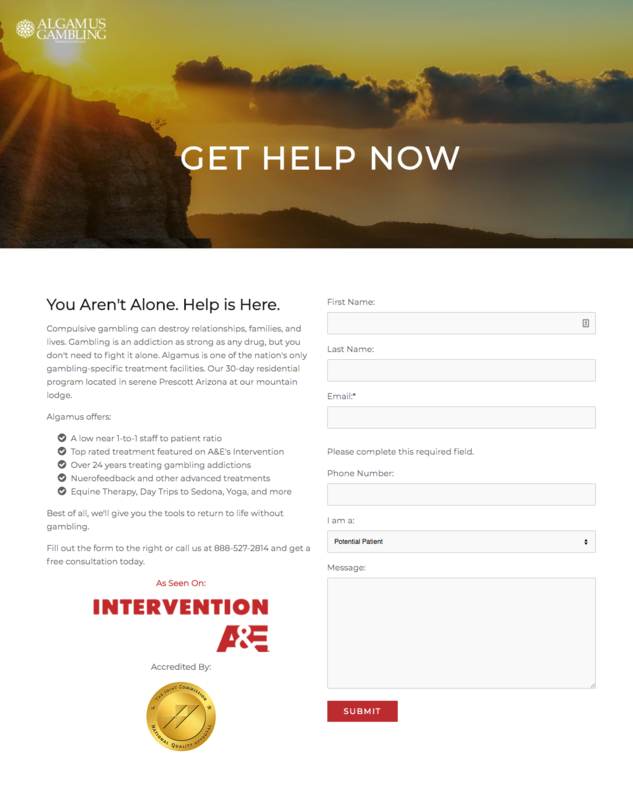 Because of the nature of addiction treatment, many potential clients had questions and opt to call instead of filing out a form, which was a large gap in lead attribution. On top of all this, Google changed regulations for addiction treatment centers, a change that put several partners and competitors out of business. Algamus needed to ensure that they were not relying on paid advertising to generate their leads, so we focused on an inbound marketing campaign to help grow the organic strength of the brand. Algamus.org was a static website with very few calls-to-action, conversion points, and stale content. It needed a refresh in design and content. Their budget was small so we kept it simple and created a launchpad website on HubSpot COS. Already, the difference was noticeable. We knew that it was important to allow people to contact Algamus quickly, without weighing down their experience on the site with too much content. For this we built custom landing pages to capture visitor information. These landing pages were built with a simple form that was hard to miss, short content telling people what they would receive, and incorporated trust building factors such as their accreditation seals and TV appearances. To address the gap in lead attribution for phone calls, we set up call tracking via CallRail. What we found was that 70% of leads coming in from the website were actually coming in via phone calls. The use of call tracking also allowed us to better manage the effectiveness of our campaigns and to shift our marketing efforts to facilitate phone calls for potential clients. Enabling click to call functionality across the site and setting up call extensions for our ads helped to further improve conversion rates for our campaigns. Calls-to-action (CTAs) that led to custom landing pages and contact forms were integrated throughout the site. This new format facilitated a quick conversation funnel by leveraging click-to-call buttons, forms on almost all pages of the site, and dedicated landing pages for key conversion points. From working closely with our client to identify their key audience we knew that there are two main buyer personas for compulsive gamblers: young men and older women. We identified a gap in the competitive landscape for content around women and gambling, and we filled that gap with a cornerstone piece of content and then several blog posts and social media sharing to support it. Using custom CTAs for this Buyer Persona and driving them to a page that spoke to them as an individual, we were better able to nurture the lead and facilitate the conversion. This inbound marketing campaign has been very successful in generating traffic to the site and our growth-driven design approach has been the key to converting that traffic into leads and clients. We've seen an 83% increase in traffic and a 125% increase in new contacts via this website. Custom content on the blog increased blog page views 335%! Using custom landing pages and forms more than doubled form submissions on the website and greatly increased leads for the client. Buyer Persona focused content has helped to increase engagement levels with our CTAs seeing click rates up to 28%. The real result here is the increase in actual clients. Previously, there would be one or two clients per month originating from the website. Now, we're averaging 5-6 clients per months via the website. This 2-3x increase in revenue generated by the website and with the high cost of admission, represents a very significant impact on the bottom line. The true impact of this inbound marketing campaign is that it allowed Algamus to stay afloat with an influx of clients at a time when their peers and competitors were forced to shut their doors. In September 2017, Google announced that it was going to regulate and restrict addiction treatment center advertising on AdWords. This created a huge upheaval in the industry and dealt a very serious blow to many treatment centers. Algamus was not unscathed in this shake up and saw a spike in AdWords costs with a decreased reach. This change made the AdWords campaign unsustainable. Thankfully, Algamus was not reliant on their Google AdWords campaign to be their main source of traffic or leads. Our inbound marketing campaign had been running for about a year at this point and was bringing in significant and increasing traffic to the website. 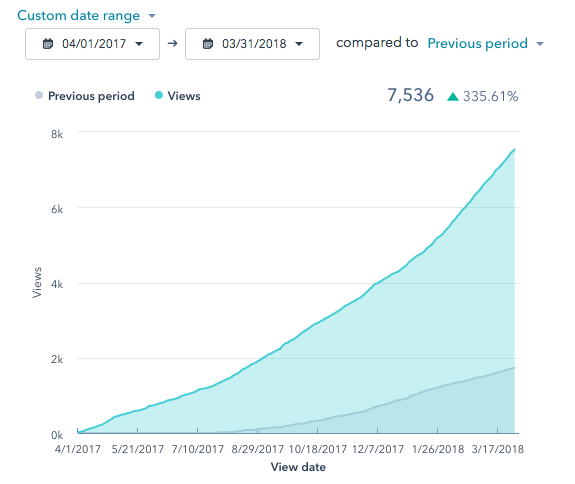 This is reflected in the organic traffic growth over 2017 as we developed more content and now into 2018 as this content continues to increase rankings in the search engines. Launching this website on HubSpot allowed us to make the incremental changes that resulted in a significant impact. The easy-to-use and clean layout of our theme allowed us to increase visitor engagement and to greatly improve conversion rates. Integrated tracking with CallRail allows us to provide better reporting on lead attribution and to better focus our marketing efforts. Our inbound marketing campaign continues to drive quality traffic to the website and to reach our ideal audience throughout their buyer’s journey. Tanya is our Chief Marketing Officer. She's an expert in digital marketing; SEO, paid search, social media, email marketing, and more. When she's not updating her numerous Google & HubSpot certifications, she's A/B testing to improve conversion rates for our clients.